Last night I finally got started on my DQS 12 quilt. I have a stack of A Stitch in Color, which is a fabric line by Malka Dubrawsky. These are fabrics are so full of colour and fun and they replicate many of her hand dyed fabrics. I decided to try making log cabins, basically following her pattern for Nate's Quilt in her book Fresh Quilting. You are correctly assuming that I am a huge fan of hers. I am not at all sure that this is my partner's style, so I may well make up another of my ideas, but for today I am going to quilt this loveliness. Thank you to everyone who stopped to celebrate my one year blog birthday with me and to share their spring/fall sewing plans. You have given me loads of inspiring ideas. This morning I visited Mr. Random Generator and selected the winner of these beautiful fat quarters which Jennifer from Dragonfly Fabric generously provided. Stephanie from Spontaneous Threads is the winner. Might be some Irish magic at play here, because Stephanie's stunning quilt won the quilt section of the Tangerine Tango Challenge - interesting coincidence. If you have not seen her quilt, go here for look and to read about how she made it, it is wonderful. And, while we are discussing luck, a happy St. Patrick's Day to you and may you have a magical spring and year. And that is a picture of my Colourbox from Oakshott Fabrics, which was delivered in 3 days after my order, all the way from the UK. It has 100 colours and comes with a handy photo for future reference. I spent a couple of evenings this week washing and ironing all of these lovely fabrics, which are even nicer after washing. I am keen to use them - maybe there will be time this weekend for that too. I am also making bee blocks, many many bee blocks this weekend, and they are all great blocks. Time to get started. Wow what a colour treat you have! I love your work with Malka's fabrics! So strong colours and fantastic together! And the colourbox - what can I say ... Enjoy! I'm a fan of Malka's as well...looks like fun. That box of Oakshott cottons looks amazing! I love Malka's fabrics, too. My DiL just asked for a picnic quilt. 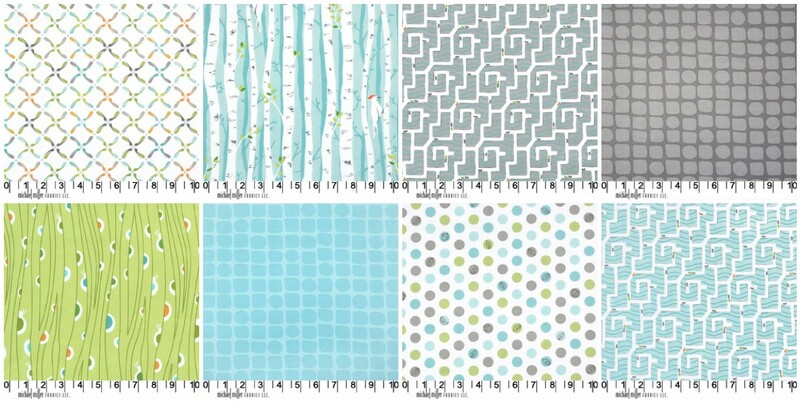 I might use these fabrics and make her a quilt with them using your idea. Thanks! I am not sure about the Malka Dubrawsky fabric, but I love the mini you've made. I have some of Malka's fabrics too, but have NO IDEA what to do with them! Your log cabin looks great. LOVE the Oakshott - oh, you will enjoy working with them, I'm sure! Have a great bee-block weekend! Beautiful mini! Love the fabrics! Very fun mini! Can't wait to see what you do with those beauties from Oakshott! Oh look at your Oakshott fabrics - pure yumminess in a box, and once you get your hands on them, they will be even better. Congrats to Stephanie! Oh those Oakshotts look amazing! Love those bright log cabins too! Love that mini, too bad I'm not in the swap! Congratulations to Stephanie. And you have Oakshott heaven there. Enjoy! Oooo that Oakshott is lovely...can I come to your house to play? Sorry I missed your blogiversary Leanne - I have been somewhat distracted this week - congrats and well done on "Shattered", worthy winner. Loving your wee Spring quilt, it is so bright and cheery. I'm working with some of Malka's fabric too. Wow those Oakshott fabrics look beautiful. I wouldn't have opened them either, I'd still be drooling on them in their box. 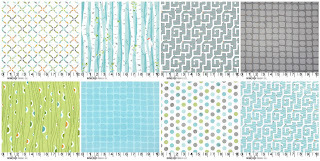 Love your little quilt with Malka's fabrics :) Have fun with those delicious Oakshott fabrics. Love the mini quilt and the Oakshott - are you sick of ironing yet?!! and congratulations on your win as well. I LOVED this mini!!! Happy blog birthday and happy Tangerine Challenge win!